Edward Shane Lechler (/ˈlɛklər/; born August 7, 1976) is an American football punter for the Houston Texans of the National Football League (NFL). He played college football at Texas A&M, and was drafted by the Oakland Raiders in the fifth round of the 2000 NFL Draft. Lechler has been named an All-Pro nine times during his career. He is the NFL's all-time leader in career punting average and is the active iron man leader for consecutive games played by an NFL player. Lechler attended East Bernard High School in East Bernard, Texas, and was a standout in football, basketball, golf and baseball. As quarterback, punter and placekicker, he led East Bernard to the state quarterfinals his senior year, completing 87 of 101 (86.1%) passes for 1,640 yards and 11 touchdowns. In his high school career, he passed for nearly 5,000 yards and averaged 41.6 yards per punt. His longest punt in high school was 85 yards. Lechler attended Texas A&M University, and played for the Texas A&M Aggies football team from 1996 to 1999. A versatile and talented player, he was not only the Aggies' punter but also kicked off, was the long field goal kicker, served as the holder for short field goals and PATs, and was the emergency quarterback. As a junior, he completed a 29-yard pass on a fake punt against Baylor and threw a touchdown pass to Dan Campbell on a fake field goal in a hard-fought 17–10 win against Texas Tech. When injuries depleted the depth chart, Lechler served as the backup quarterback for the 1998 Big 12 championship game. At one point in the game, the Aggies' last healthy quarterback Branndon Stewart appeared shaken and a nervous-looking Lechler threw warmup passes on the sideline. Stewart was able to stay in the game, however, and led the Aggies to a 36–33 victory over Kansas State, earning the Aggies their only Big 12 championship. Because of his contributions in so many facets of the game, coach R. C. Slocum called Lechler "the team's most valuable player." Lechler started his career off strong at Texas A&M, earning Freshman All-America honors in 1996 with a punting average of 42.7 yards. After his sophomore season, he was named to the All-Big 12 team after breaking the Aggie single season record with an average of 47.0 yards per punt. He was named to The Sporting News All-America team as a junior in 1998, and was also an Associated Press first team All-American honors as a senior in 1999, a year in which his 46.5 yards per punt is second in the record books only to his own sophomore record of 47.0. He is the NCAA record holder for career punt average with a mark of 44.7 yards per punt. He made six career punts of 69 yards or longer, and 38 "coffin-corner" kicks in his final two seasons. He was also voted to the All-Big 12 Conference first team by the league’s head coaches, The Associated Press, the Austin American Statesman, The Dallas Morning News, Football News, the Fort Worth Star-Telegram, the Houston Chronicle and the Kansas City Star. Lechler had only one punt blocked, against Ohio State in the 1999 Sugar Bowl, and only one of his punts was returned for a touchdown, during his college career. Lechler punts at a home game against the Atlanta Falcons on November 2, 2008. Lechler with the Raiders in October 2010. Since entering the NFL in 2000, Lechler has set various NFL and Oakland Raiders records. He was a Pro Bowler in 2001, 2004, 2007, 2008, 2009, 2010 & 2011, and was voted All-Pro in 2000, 2001, 2003, 2004, 2007, 2008, 2009, 2010 & 2011. He holds the NFL record for best average per punt in a career (47.3), surpassing even the legendary Sammy Baugh. He has the five best single-season punting averages in Raiders history, including a career-best 51.1 in 2009, the second highest single season average in league history (to Baugh's 51.4 in 1940). He recently raised his Raider record for most punting yards in a season with 4,909 in 2009. He booted at least one punt of 50 yards or more in 33 consecutive games from Week 13 of 2003 through Week 14 of 2005, the longest streak by any player since the AFL/NFL merger in 1970. He has been named the AFC Special Teams Player of the Week twice, and has played in 158 regular-season league games and seven playoff games, including Super Bowl XXXVII. In the 2008 Pro Bowl game, he punted for 55 yards. On February 18, 2009 he signed a four-year, $12 million contract, making him the highest paid punter in NFL history. 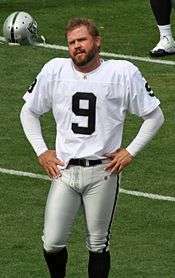 In Week 6 of the 2011 season, as the holder for placekicker Sebastian Janikowski, he threw a 35-yard touchdown pass to tight end Kevin Boss on a fake field goal attempt. In Week 12, on November 27, 2011, he kicked a career-best 80-yard punt against the Chicago Bears. That punt, kicked from his own 10-yard line (the Oakland 20 was the line of scrimmage), bounced at the Chicago 11 and went into the endzone after traveling 79 yards in the air, setting a franchise record for the longest punt by an Oakland Raider. On March 23, 2013, Lechler signed with the Houston Texans. The contract is a three-year deal worth $5.5 million with a $1 million signing bonus. During Week 10 on November 10, 2013, Lechler became just the sixth player in NFL history to reach the 50,000 punt-yard mark during his second punt of the game against the Arizona Cardinals. During Week 15 on December 14, 2014, third string quarterback Tom Savage was injured with under 2 minutes left and Houston down 7, needing a touchdown to tie the game. All of their other quarterbacks were injured, and Lechler, a former high school QB, began to warm up. Houston called a timeout after the injury and Savage stayed in the game, throwing an interception on the very next play. Lechler never entered the game. On December 15, the Houston Texans signed quarterback Case Keenum from the St. Louis Rams practice squad. On March 11, 2016, Lechler signed a one-year, 1,300,000 dollar contract with the Houston Texans. Shortly after the contract signing, Lechler stated that he believed his team was capable of winning a Super Bowl. Lechler is married to Erin Gibson, who was an All-American volleyball player at Texas A&M. He comes from an athletic family: both of his parents participated in Baylor athletics, and his brother Derek was a punter for Texas A&M. Lechler has said he is good friends with teammate and All-Pro defensive end JJ Watt. ↑ "Shane Lechler". pro-football-reference.com. Retrieved 2011-09-15. ↑ "Small-town guy making big-time kicks: A&M's Brantly ranked fourth in yards per punt". ↑ "Shane Lechler". Pro Football Weekly. Archived from the original on 2002-06-17. ↑ "Could punter's Raiders tenure be over?". ↑ Duncan, Chris (March 23, 2013). "Texans Sign Shane Lechler". espn.go.com. Retrieved March 23, 2013. ↑ Wilson, Aaron (March 11, 2016). "Contract details for Texans' Shane Lechler". Chron.com. Wikimedia Commons has media related to Shane Lechler.